If you live in San Diego, chances are there's an olive tree or two growing in your neighborhood. In fact, the history of the olive industry in California starts in San Diego. The trees planted by Spanish Missionaries at Mission San Diego de Alcala at the turn of the 19th century provided the cuttings for most of the trees planted across the state and sold in nurseries across the country (ever heard of The Mission Olive?). Monoculture, overproduction and the olive fruit fly led to a decline in commercial production of olives in San Diego county, but many of the trees remain and some of them offer up beautiful, fruit-fly-free fruit that is perfect for curing at home. When curing olives, you've got a few options. You can ferment them as you would a kosher pickle in a process that takes up to year to complete or you can take a couple of shortcuts and start snacking in three weeks. 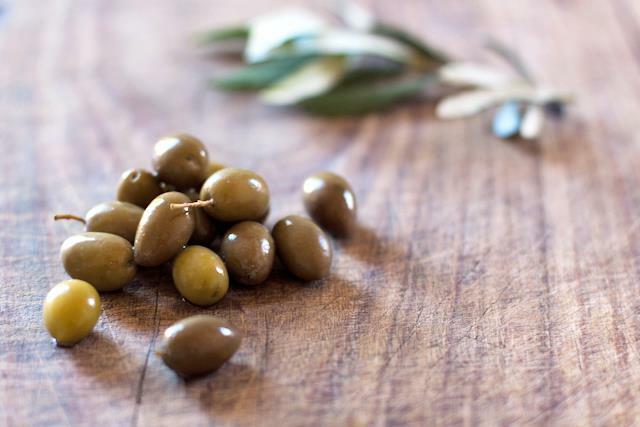 The University of California Davis offers this extensive guide on olives and olive curing. Here are our favorite and tested methods from their guide for curing olives in 2 - 6 weeks. Use green-ripe fruit of any variety to prepare this style of olive. After these olives are cured and placed in the finish brine, you can also add a variety of seasonings, such as oregano, garlic, and lemon slices, to provide additional flavor. 1. Sort the olives according to size, if desired, and discard any bruised or defective fruit. 2. Rinse the olives in water, and drain. 3. Place olives one or two at a time on a clean cutting board and strike with the flat side of a mallet or with a rolling pin. Crush each olive just to crack the flesh—do not break the pits or remove them. 4. Place the cracked olives into a food-grade plastic pail (or other container as listed above) and cover olives with fresh, cool water. Keep the olives submerged by placing a heavy plate or a sealed plastic food-storage bag filled with water over the fruit. Close the container lid loosely and leave the olives to soak. 5. After 24 hours, drain the olives and cover again with fresh, cool water. Repeat the water change daily for 6 to 7 days to reach the desired level of de-bittering. If you want less-bitter olives, continue to soak for a few more days and change water daily. 6. Prepare the finish brine—add 1 pound (11⁄2 cups) of pickling salt to 1 gallon of cool water, stir to dissolve, and add 2 cups of white wine vinegar. This amount of solution is enough to treat about 10 pounds of fresh olives. 7. Drain the de-bittered olives and cover with the finish brine. At this point you can add herbs or other seasonings if desired, such as chopped oregano, lemon slices, and garlic cloves. Close the container lid firmly and refrigerate. Note: These olives must be kept refrigerated. The olives are ready to eat after 4 days in the finish brine or you can allow the flavors to develop more fully during longer refrigerated storage. 8. These Mediterranean-style cracked olives can be stored in the refrigerator for up to 1 year in the finish brine. Prepare dry salt cured olives from fully ripe, mature fruit that is dark red to black. Oil-rich varieties such as Mission are commonly used, but other varieties will also work. Use smaller olives; larger ones will soften too much during the process. Salting dehydrates the olive flesh, resulting in a soft, moist, shriveled product. Dry salt cured olives will be ready to eat about 5 to 6 weeks after you begin the salting process. These olives are salty and also slightly bitter because dry salt curing removes less oleuropein than other methods. Dry salt cured olives can be stored for up to 6 months in a refrigerator, as described below, or they can be frozen for longer storage (see Methods for Preserving Cured Olives). 1. Sort the olives and discard any bruised or defective fruit. 2. Prepare a large container that will hold the olives and salt. Use a slat wood box, a large wicker basket (it will likely stain), or a plastic bin with some drainage holes cut into the bottom. Line the bottom of the container with clean cheesecloth or nylon mesh. NOTE: Place the container outdoors (under cover) or over a large pan so the draining brine will not ruin your floors. Raise the container on small blocks to improve air circulation around the bottom. 3. Weigh the sorted olives and place them into the container. Add about 1 pound (11⁄2 cups) of pickling salt for every 2 pounds of olives. Mix the salt and olives very thoroughly in the container to distribute the salt and prevent mold from developing. Pour a 1-inch layer of additional pickling salt over the olives. Cover the container with clean cheesecloth and let it stand at about 60° to 80°F. 4. After 1 week, re-mix the salted olives by pouring them into a clean pail and then back into the first container. Add a small layer of salt over the top of the olives. Cover the container with a clean cloth and let it stand. 5. Repeat the mixing process once a week for the next month, until the olives are cured and edible. 6. When the olives are ready, pour them over a coarse screen to sift out any remaining salt. Allow the olives to dry overnight at room temperature. 7. Before storing the olives, add 1 pound (11⁄2 cups) of pickling salt to each 10 pounds of cured olives. Mix the olives and salt thoroughly and pack them into airtight containers (to minimize surface yeast and mold growth). Store in a cool place and use within 1 month, or refrigerate for up to 6 months, or store in a home freezer for up to a year. (Olives tend to become rancid if stored longer.) You can use these olives, as is, for cooking. For eating out-of-hand, you can first dip the olives briefly into boiling water to remove salt, allow them to air dry, and then rub them with a little olive oil and add herbs, such as rosemary, before serving. WHERE TO FIND OLIVES IN SAN DIEGO? Check out this video on planting olive trees from Peaceful Valley.